Now that the snow is here to stay it is time to cover a bird that is common here in winter. Since winter birds have not yet arrived from the north one is left only with permanent residents. To me, permanent residents are sort of special because they provide some measure of stability in the environment when everything else is changing with the seasons. One of our permanent residents that is seen more often in the winter than in the summer is the Great Horned Owl, so named because of the feathered tufts on its head that look like ears or horns. Being nocturnal for one thing and being busy rearing young for another creates the impression that the owls are absent in the summer. They are not. In rural areas they can most often be heard and seen around dusk especially on warmer winter days. Their low pitched but powerful hooting can be heard a long distance away. The only other owl that it can be confused with is the crow sized Long Eared Owl (see Art. No. 35). The easiest way to tell them apart is by the pattern of the brown and white markings on the breast and belly. The Long Eared has brown streaks (stripes) that run the full length of its breast and belly; the Great Horned has the brown streaks (bars) run across the breast and belly. In other words, the Long Eared is striped; the Great Horned is barred. 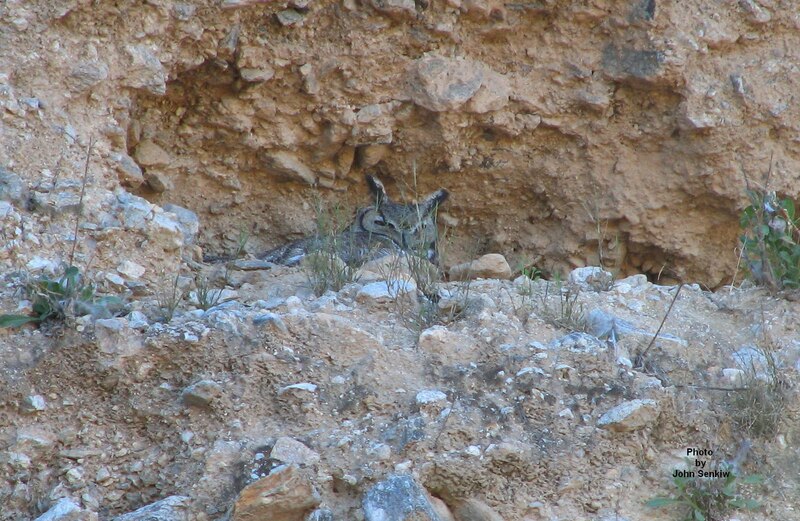 Locally, only the Great Horned is present in the winter. The chicken sized Great Horned Owl is one of our largest and most powerful owls being able to take prey animals the size of skunks which they often do. (It is a good thing owls do not have a sense of smell). More than once, as a youngster on the farm, I would be in bed for the night with the windows open and hear one of our cats yowl in terror followed by silence. Even though nobody actually witnessed the event, everybody knew that one of our cats had become owl dinner. In one sense it was a bit sad but on the other hand it did keep the cat population in check. Anyway, nature is what nature is and that is about all there is to it. 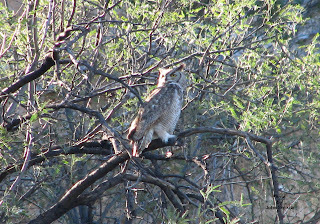 Locally, Great Horned Owls start to nest as early as March utilizing previous years' crows' nests. This early start gives the young a chance to mature and learn how to become good hunters over the summer time when prey is young, not too wise and plentiful. Even so many juveniles actually starve in the winter. There have been reports of owls actually falling out of trees, dead, from lack of food. Winter is an especially difficult time for all predators. This week's photos were taken in a rocky area of the Saguaro National Park on the outskirts of Tucson, AZ. Incidentally, this is the place where my wife's sharp eyes prevented my stepping on a four to five foot Diamond Back Rattlesnake that was stretched out on the path directly in front of me. We waited patiently as it slowly moved off. 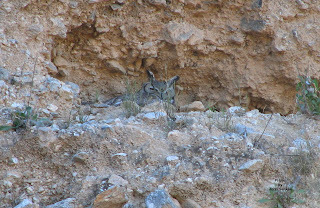 Anyway, the excellently camouflaged female owl was sitting on her nest on a ledge on a cliff while the male was sitting guard a short distance away. Males and females are the same. The birding groups we were with took great pains not to disturb the nesting owls. Our guide told us that it was to prevent the owls from abandoning their nest. I was not so sure. Great Horned Owls have been known to attack human intruders viciously leaving some severe damage around a person's head and neck. Whatever the reason it is best to keep a nesting Great Horned Owl and people apart. After the excitement of seeing Whooping Cranes last week the birds at the feeder seem quite ordinary, but on the other hand, the good variety of birds in our yard provides lots of interest. To date we have seen White and Red Breasted Nuthatches, Hairy and Downy Woodpeckers, House Finches, Pine Siskins, Chickadees, House Sparrows and two that should not be here - a Robin and a juvenile Harris Sparrow. We know that there are more winter birds to come. Rurally, Canada, Snow and Ross's Geese are still here as are some ducks and coots. The recent blizzard does not seem to have interfered with them at all and larger bodies of water that have not yet frozen over are often full of water fowl. The upcoming heat wave will probably keep them here even longer. One of the last of the diving ducks to migrate south is the Lesser Scaup Duck. In the summer time it is probably the most common duck to be seen on larger permanent bodies of water. Because it spends all of its time on the water, including nesting, it is seldom noticed and most people do not even know that it exists. 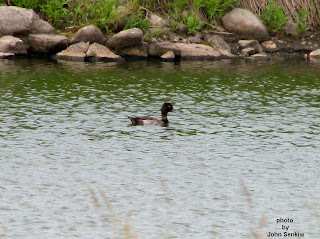 There are four divers (Red Head, Canvas Back, Ring Necked and Lesser Scaup) that, at a distance, look very much alike. All four ducks are whitish with dark heads, necks, breasts and tails. All four look as if somebody took a whitish duck and dipped its front and rear ends in dark paint. At close range or with binoculars the Red Head and Canvas Back can be separated quite easily because of their brownish red heads. The more similar Ring Necked can be separated from the Scaup by (1) its all black back whereas the latter has a light grey one; (2) the Ringed Neck has a black bill with a bold white ring or band around the tip while the Scaup has an all blue bill. Scaups are often called bluebills but it is not a good name as some other ducks also have blue bills. On lakes and larger rivers matters become much more complicated as these waters harbour the extremely similar Greater Scaup Duck. The similarity is so great that only very experienced birders can tell them apart. The Greater is a little larger but only marginally so that even in a mixed flock this field mark is of no use. In good light the drake Lesser gives off purple reflection off his head, while the Greater gives off greenish ones but the differences are subtle to say the least. Experts use head shape for identification but it takes a good bit of practice to use this field mark with any confidence. The hens are an almost identical medium brown. The two Scaups could be found at the Foam Lake marsh providing some challenging practice in identification. Although they are still quite common experts tell us that the Lesser Scaup population is plummeting for some as yet unknown reason. One explanation is that the last decade or so has been very dry resulting in lack of suitable nesting sites. Whatever the reason, hopefully, the trend is only temporary. This week's photo of a drake Lesser Scaup was taken in a slough alongside the Dunlop road just east of town. Although they may be scarcer now they are still around.